CasinoBonusNews → Casinos → "PAF Casino review"
A player’s first impressions of PAF Casino may not be promising. The site’s front page lacks the same style and charming themed looks that most people come to associate with online casinos. It can be possible to be won over, however, based solely on the selection of games and the wide variety of options that come with a multiplatformed casino. 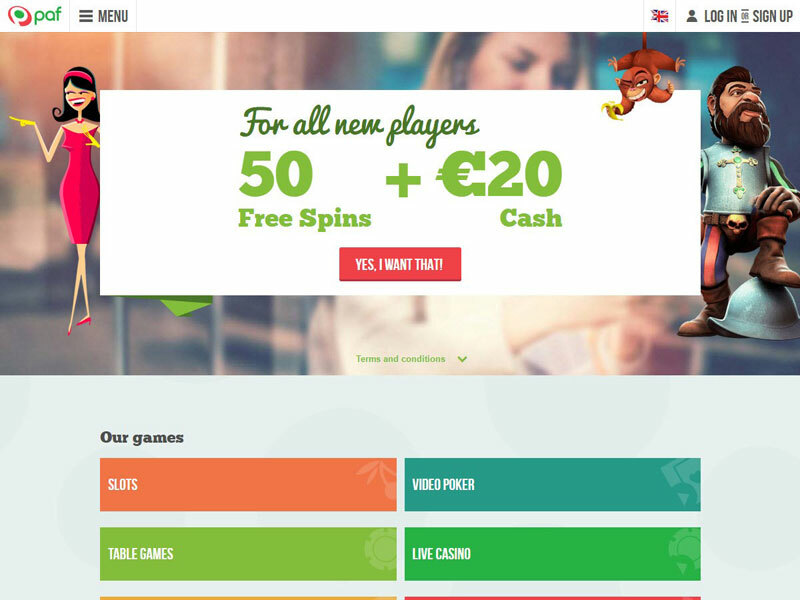 PAF Casino has elements of Net Entertainment, Playn Go and Gtech within its infrastructure, which means some of the best games on the Internet are hiding behind the rather ugly exterior. PAF stands for Play Among Friends, and it is easy to see what the site is trying to be. It is up to the individual as to whether it is worth stepping into this casino and giving it a decent try. PAF is strictly a browser-based casino. That means no downloading software, which can be a good thing. This also means the player is stuck trying to navigate the site without much direction. The games are divided among a series of tabs that run across the top of the screen, but when a section has too many games to display on one screen, like the slot machine list, the games are divided into pages that one has to go rummaging through to find the exact title he or she is looking for, or else, change the layout so that the player can see all of the names of the games, but not their icons. Once they get to exploring, though, players run into some great titles. 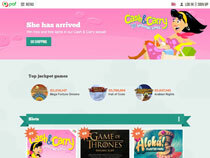 The site’s slot machines include several with progressive jackpots, like Mega Fortune with its jazzed-up music or Lucky Star with its outer space theme tune. There is a casino floor with games like roulette, blackjack, Red Dog, Casino Poker, Three Card Poker and baccarat. Or, players can try out the live dealer version of roulette, blackjack or baccarat. The casino has a lottery section where players can try out bingo, keno or the scratch card selection. There is a bingo hall, a poker room, a sports book and even a backgammon room. Most of the casino games can be tried out for free in a demo mode, but some require the player to sign up for an account before they can be played, and all games require an account if the player wants to earn real money. This is where the bonus fun begins. Bonuses at PAF aren’t the same as with other casinos. 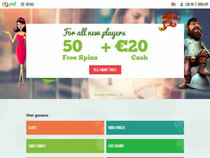 Sure, players who look for sign up bonuses may find them through review sites like this one, but if a gambler goes looking through the site itself, he is likely to come across Club PAF, which describes drawings and competitions, like the current chance at winning a Roomba or the drawing to win a trip to Spain. Excellent prizes, but not the deposit bonuses most gamblers seek. The key is to watch out while browsing the entire site and look for the word “campaign.” These campaigns will pop up from time to time and offer percentage bonuses. PAF is currently offering a no download bonus for new players as well, although it doesn’t advertise how much the offer is up front. After signing up with PAF, a player can add money to his or her account just like any other casino. The gambler can choose from several different payment methods based on which country he calls home. Most people can work with e-wallets like NETeller and Skrill, which are the methods the casino prefers since it can also process withdrawals to these as well. PAF Casino also accepts credit cards and prepaid cards. The accept funds and return winnings in euros, British pounds and Swedish krona, with payments made in other currencies subject to exchange rates. The Web site can be accessed in English, Spanish, Russian, Finnish, Swedish and Estonian. If a player needs to contact the help desk, they can do so by either calling the telephone number provided for that player’s country or by submitting their request and email address on the form available on the Web site. They will need to check with their email for the response.